PARIS — Co-host Germany came crashing back to earth at the ice hockey world championship by losing to Sweden 7-2 on Saturday, the day after upsetting the United States. The Germans were brimming with confidence from beating the Americans 2-1 and this match was well poised at 2-2 early into the second period in Cologne. But 2013 champion Sweden — which lost to Russia in overtime on Friday — stepped up a gear to move top of Group A. 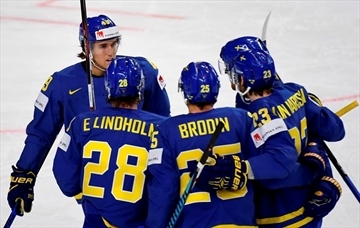 Center William Nylander atoned for missing in the shootout loss to Russia with two goals and an assist; while left winger Gabriel Landeskog had a goal and two assists in a captain’s performance for nine-time champion Sweden. Meanwhile, the Czech Republic bounced back from a heavy opening loss to defending champion Canada by routing Belarus 6-1. After losing 4-1 to Group B rival Canada on Friday, the 2010 champion Czechs were in rampant form. Forwards Petr Vrana, Roman Cervenka and Jakub Voracek all netted while the other goals were scored by defencemen Radko Gudas, Radim Simek and Michal Kempny. It was a second straight loss for Belarus. Also in Group B, veteran left winger Patrick Thoresen starred with two goals and an assist as Norway downed co-host France 3-2 in Paris. Center Stephane Da Costa scored both French goals. Switzerland blew a 4-0 lead before scraping past Slovenia 5-4 in a shootout. The Swiss, beaten finalists in 2013, struck a four-goal salvo in the first period, with Andres Ambuhl, Gaetan Haas, Romain Loeffel and Simon Bodenmann scoring. Slovenia pulled goaltender Gasper Kroselj and replaced him with Matija Pintaric and clawed its way back with a goal from right winger Jan Mursak midway through a feisty second period. Winger Robert Sabolic went on to level the score late on. After overtime failed to separate the sides, Swiss forward Damien Brunner scored the first and only goal in the shootout, with the next two Swiss players failing to score. Rok Ticar, Sabolic and Mursak were those to miss for Slovenia. Also in Group A, Slovakia equalized with one minute left and defenceman Peter Ceresnak scored in overtime to top Italy 3-2. Latvia beat Denmark 3-0. Claudia Téllez sat in her parents’ home in Guadalajara, a fedora perched on her head, ready for an early morning interview on one of her rare days off. A career in hockey is something she’s chased for what feels like her entire adult life, and this is a part of it she takes on willingly—gladly—even if it means giving up some of her precious vacation time. 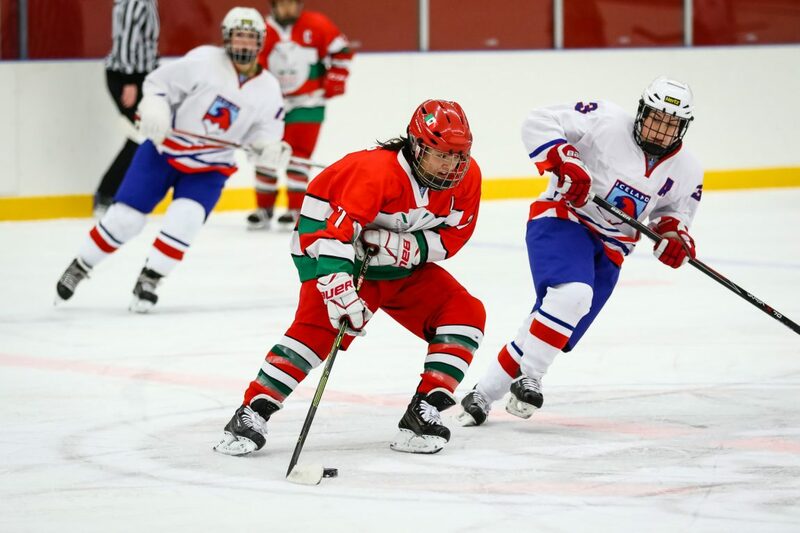 Téllez is the international face of Mexican women’s ice hockey. How she got to this point has taken nothing short of a leap of faith. “When I was younger, Guadalajara didn’t have women’s hockey and my family didn’t like that I wanted to play hockey,” Téllez said. “It was for boys, and so on. My father’s a basketball player and my mother played volleyball so they thought I’d take up one of those sports. That’s not how it went, though.” While Téllez started out in basketball, she soon learned about an inline hockey team when a friend of hers organized a game of street hockey at a nearby rink for her own birthday celebration. “I had a street hockey stick,” Téllez recalled. “One of those with the wooden handle and a plastic blade—Franklin, I think, was the brand. The four of us went to play at the rink, and just by chance, there was a group of PeeWees, training for a national competition.” Téllez was captivated. She ran home afterwards to break the news to her parents: she wanted to play inline hockey. “My mother said, ‘if you pay for it…’” Téllez grinned. She worked an after-school job to afford her equipment and team fees, dropping basketball for good. Her natural talent was obvious, and she soon made it to the national inline team. Twelve years later, when Mexico started its own women’s ice hockey initiative, she was asked if she would be interested in making the jump to ice hockey at the age of 29. It’s an understatement to say Téllez was somewhat reluctant. “I didn’t like it,” Téllez said of learning to ice skate. “I dominated in roller hockey. On rollerblades…yeah, I dominated. And so, when I switched over to ice….My coach in Guadalajara was like, ‘You have to play!’ ‘I don’t want to!’ ‘You have to!’ So, I got on the ice and tried to do the same thing I did on wheels. I went flying, I hit the boards. It was a little frustrating because I couldn’t do the same stuff I was used to on rollerblades. Téllez stuck with it, though. She saw the same opportunity Mexico did: the chance to make the Olympics. With such a small field of competition on the women’s side of ice hockey, Mexico stood a much greater chance of making the Olympics in women’s hockey than in men’s. The Mexican ice hockey federation began pouring everything they had into the sport with the goal of making the shortlist for the 2018 Olympic Games. Although only eight teams including the host country are invited to participate, Mexico stood a good chance. Many of the players, Téllez included, relocated to Mexico City to train full-time. She lived in government-supported athlete housing and supplemented her income by working as a manager for the Mexican Ice Hockey federation. Although she quickly made a name for herself on the ice, Téllez truly made her mark on the business side of Mexican ice hockey. She was charged with organizing the first Pan-American games—the first Latin American ice hockey tournament—which was something she undertook not just to advance ice hockey in Latin America, but also because it was important for the development of Mexican sports in general. Téllez sees events like the Pan-American as an opportunity for Mexico to advance itself as a leader while also growing hockey domestically. Team Mexico may have fallen nearly 15 spots short of its stated goal of making the Olympics only four years after launching its first official women’s ice hockey program, but Téllez is extremely proud of her team and what it has achieved in such a short period of time. Team Mexico recently played its way up three spots to a berth in division IIA, making it that much closer to a spot in the 2022 Olympic rotation. At no. 29 in the world, Mexico still has quite a ways to go, but the future is bright. “I think we’ve had a good start,” Téllez said. “We knew it would be complicated. We’re throwing ourselves at our new division. We knew that the higher in the rankings we went, the more complicated it would be but, well, it’s the foundation for future Olympic cycles. Imagine how good they’ll be in three whole years with the new vision, the new motivation to get to an even higher division than we’re in right now. Mexico will now face off against teams such as Great Britain, Australia and South Korea, programs that were birthed several few Olympic cycles ago and have shown steady growth since, thanks to the dedication of their players. South Korea in particular will prove even tougher competition after training for and competing in the upcoming 2018 Olympics as the host country. Playing against teams of this caliber will likely help Mexico launch itself even further. Now, having tasted victory, the team is both motivated to keep winning and anxious to start training. Téllez, the coaches, the federation are all on the same page, all putting their best into this next stage. The Olympics aren’t her only goal; Téllez also applied for the Canadian Women’s Hockey League draft last summer, where she was drafted by the Calgary Inferno, the winners of the 2016 Clarkson Cup. This made her the first Mexican woman ever drafted by the CWHL. Téllez ended up making the Inferno’s reserve squad, spending much of the year in training, flying out to Calgary for chunks of the season to practice with the team in hopes of making the first squad this season. What’s next on the docket for Téllez? She’ll participate in the Pan-American Games in June, then she’ll attend a hockey camp in Canada this summer. Along the way, she’ll look to get in the best shape possible, train some more in Mexico, then head to Calgary’s training camp in September with the goal of making the first team.